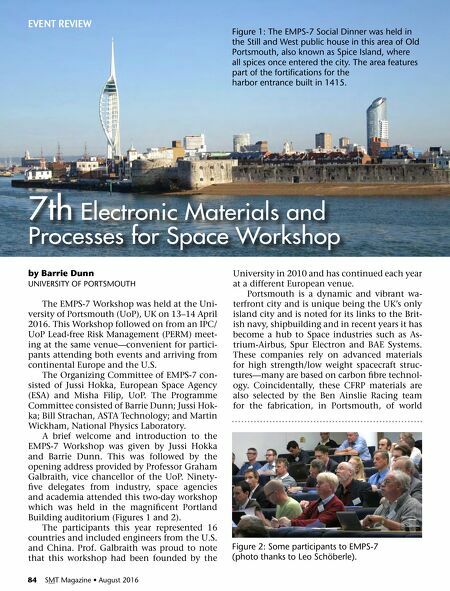 84 SMT Magazine • August 2016 by Barrie Dunn UNIVERSITY OF PORTSMOUTH The EMPS-7 Workshop was held at the Uni- versity of Portsmouth (UoP), UK on 13–14 April 2016. This Workshop followed on from an IPC/ UoP Lead-free Risk Management (PERM) meet- ing at the same venue—convenient for partici- pants attending both events and arriving from continental Europe and the U.S. The Organizing Committee of EMPS-7 con- sisted of Jussi Hokka, European Space Agency (ESA) and Misha Filip, UoP. The Programme Committee consisted of Barrie Dunn; Jussi Hok- ka; Bill Strachan, ASTA Technology; and Martin Wickham, National Physics Laboratory. A brief welcome and introduction to the EMPS-7 Workshop was given by Jussi Hokka and Barrie Dunn. This was followed by the opening address provided by Professor Graham Galbraith, vice chancellor of the UoP. Ninety- five delegates from industry, space agencies and academia attended this two-day workshop which was held in the magnificent Portland Building auditorium (Figures 1 and 2). The participants this year represented 16 countries and included engineers from the U.S. and China. Prof. Galbraith was proud to note that this workshop had been founded by the University in 2010 and has continued each year at a different European venue. Portsmouth is a dynamic and vibrant wa- terfront city and is unique being the UK's only island city and is noted for its links to the Brit- ish navy, shipbuilding and in recent years it has become a hub to Space industries such as As- trium-Airbus, Spur Electron and BAE Systems. These companies rely on advanced materials for high strength/low weight spacecraft struc- tures—many are based on carbon fibre technol- ogy. Coincidentally, these CFRP materials are also selected by the Ben Ainslie Racing team for the fabrication, in Portsmouth, of world 7th Electronic Materials and Processes for Space Workshop EVENT REVIEW Figure 1: The EMPS-7 Social Dinner was held in the Still and West public house in this area of Old Portsmouth, also known as Spice Island, where all spices once entered the city. The area features part of the fortifications for the harbor entrance built in 1415. Figure 2: Some participants to EMPS-7 (photo thanks to Leo Schöberle).